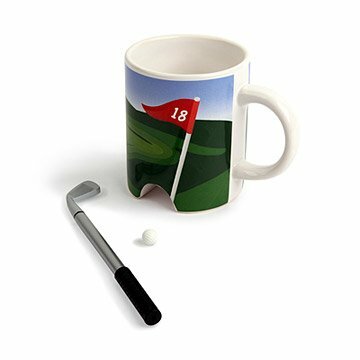 Putter around on your coffee break with this 18th-hole mug, which includes a miniature club and ball. It's tee time! Whether you prefer tea, coffee, or hot cocoa, this sporty mug will help you get through the back nine of your day. Its illustrated surface has an actual opening at the 18th hole, so you can use the included miniature club and ball to putter around on your break. The club even has a built-in ball point pen for keeping score. Made in China. Mug is dishwasher safe. Do not microwave. This is a gift for my grandmother who is a full time golfer! This was the perfect mug and I was so happy when it came early. As soon as I have this to my brother in law he already wanted to start playing with it! I think my husband will love this coffee mug. HOWEVER, I am bummed that it's not microwave safe as he often microwaves his coffee at some point each morning. The image wrap had two very minor blemishes. I bought two mugs for the birthday boy so that he can share the fun with his golfer wife. My retiring boss was pleasantly surprised to receive this gift. She said it was very thoughtful. The flag is slightly different than pictured. It's a square and does not have a number. It didn't bother me; it was just different. Product is great and compact! It's easy to move around and to cook! They use it for coffee in the morning and for writing down notes.